Welcome | Fuller, Ritchie, and Sturgess, INC.
Rotary Drum Getting Old?? GK Can Help! The CD-Express from General Kinematics is a low cost, entry level recycling system designed for high efficiency recovery of material. The CD Express system is designed to handle up to 150 yards per hour (115 m3 / hr.) for separation of OCC, wood, ferrous and non-ferrous metals, rock / cement, dirt / ADC, plastics, and other types of typical C&D materials. 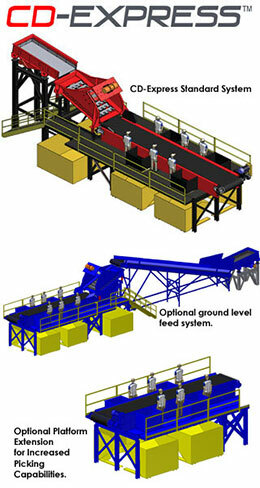 Systems include primary screening with a quad station pick line, all mounted to an easy to install support system designed to utilize roll-off containers as material sorting bins. Low feed system includes vibratory feeder and inclined belt to enable system loading with front end loader or skid steer. Protect your workers from weather and the elements. For automated removal of metallics from waste stream. Extended platform assembly increases pick stations for greater separation. ►Easy to install system design. ►General Kinematics Finger-Screen™ for separating minus sized material from overs. ►Heavy-Duty pick belt and sorting bins. OUR COMPANY incorporated in 1967 as a manufacturers representative organization to handle the equipment needs in several heavy industries such as foundries, steel, power plants, coal mining, etc. 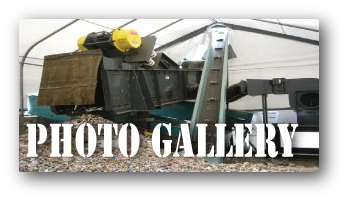 Over the years we have become more and more involved in the glass, rubber, waste handling & recycling industries for a variety of material handling and processing applications. We are dedicated to maintaining a high degree of business and professional ethics as well as maintaining an active role with our customers throughout their capital expenditure projects.